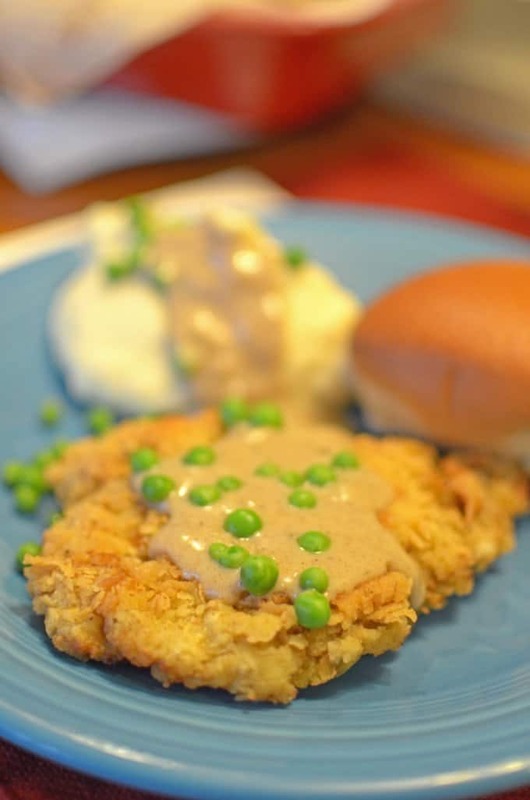 Chicken Fried Steak and Gravy has been on my short list for sometime now. Round steak cutlets that are tenderized, coated with seasoned salt and then pan-fried. 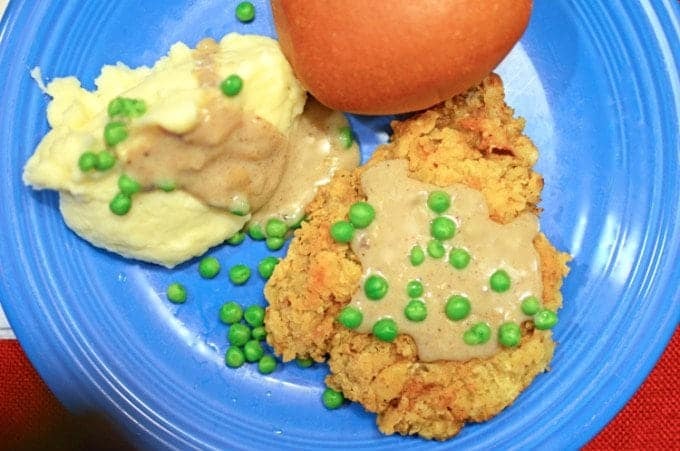 My good friend and daughter of Texas has been promising to make this southern-styled meal for us, for sometime now. Earlier in the week it happened and may I just say that this southern delicacy was well worth the wait. I always find it amusing when friends tell us they are “afraid” to cook for us. We hear it frequently but the truth is that it is always a treat when someone prepares a meal for us. Throw a little gravy into the equation and I find myself dead center on “main street,” as my dad use to say. I would imagine that most of you who are parents can relate. Even if you don’t have kids, it’s just nice to have a friend make a meal for you now and then. Almost like a good massage and usually, in my opinion, often more welcomed than such. When someone else makes a meal for me, most things just always taste better to me. When Scott puts a meal on the table I am always amazed by what he puts together. He’s an excellent cook and as we found out by this meal, our good friend April falls into that same category. April is not only a skilled cook, she also overflows with southern hospitality. 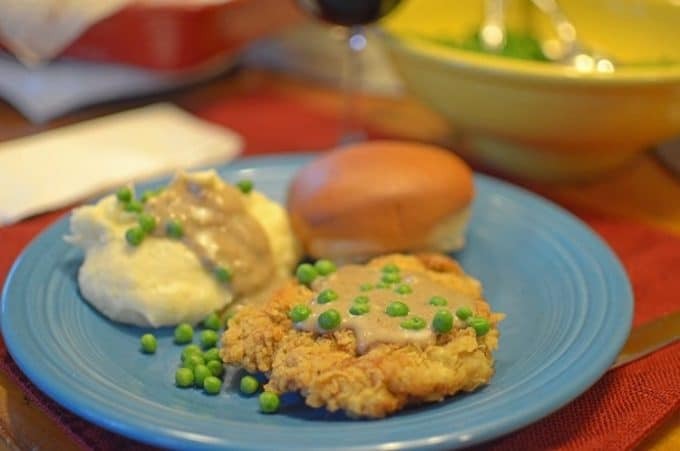 As the “Y’alls” were exclaimed throughout this process by our hostess, she carefully explained all of the steps to making this chicken fried steak and gravy. 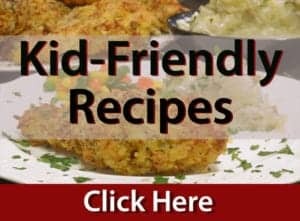 I have to be honest, the more in depth she went into this recipe and as the house filled with the aroma from her kitchen, the more challenging it was for me not to try a sample of this southern standard. Confession time: Perhaps I did sneak a small edge piece here and there when I thought no one was looking. Likely the only person I was fooling was myself but if they wanted a sample in waiting I wasn’t going to stop them, or judge. Prepare steak by tenderizing with a meat hammer. 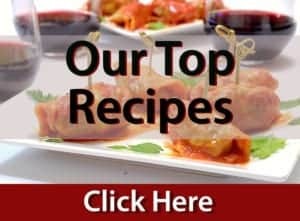 Because this is a cheaper and tougher cut of meat, the steaks should be tenderized extensively (you should be able to see through portions of the steak). After tenderizing, cut steaks into portions sizes (about the size of a hand) and tenderized further by sprinkling season salt/meat tenderizing salt on steaks. You can do this part ahead of time so the tenderizing salt can do its jobs. Fill large skillet with oil (I use canola) and heat on medium. Oil should get very hot. While the oil is heating, you dredge steak. Fill a large container with flour. You may season flour with salt and pepper. Crack the eggs into a large bowl, add ¼ cup of water to eggs, and whisk. To dredge, dip steaks in flour and lightly coat. Next immerse in egg mixture, and finish by dredging again in flour, this time thoroughly coating the steak. When oil is hot, use tongs to place steaks in pan. Steaks will cook 4-6 minutes per side (see pictures for ideal color of crust). 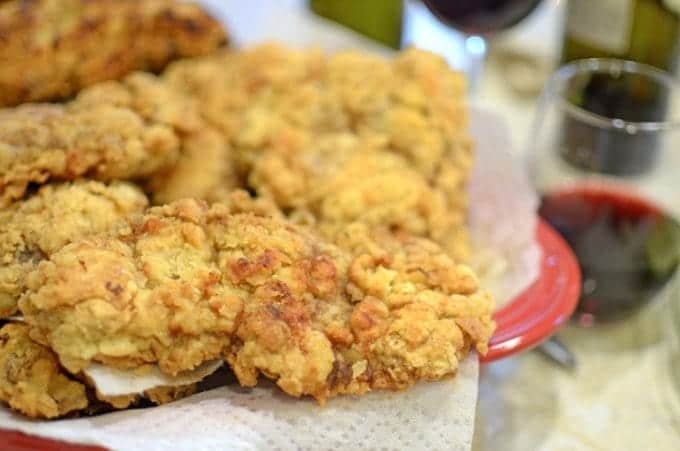 If making a large quantity, I preheat the oven to 200 degrees and place finished chicken fried steak in an oven save dish to keep warm. 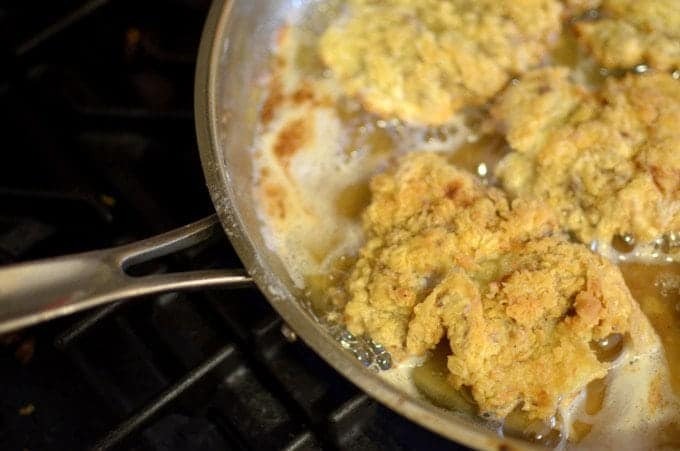 After you have finished the chicken fried steak, draining skillet until you have about 2 tablespoons of oil left in the pan. Sprinkle 1/8 cup of flour into pan and immediately begin whisking to mix with oil. Have milk ready!!! As soon as flour is whisked in, begin pouring milk. There isn’t an exact amount (my mother always told me, “Pour until there is enough!”). Here I have estimated between 2-3 cups. When pouring, constantly whisk and break away bits left over from frying and mix into the gravy. Keep heat at medium and stir constantly. Gravy should thicken after several minutes. 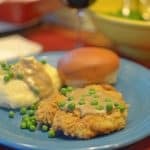 I love it when someone else does my cooking, especially if it was this yummy chicken fried steak! My hubs is from Montana, he grew up on this! Yum, yum and yum! Winner winner chicken dinner! This looks incredible and is one of our favorite recipes in the wintertime! Yummy! That coating looks absolutely perfect, am going to bookmark this to try later! Words cannot describe how much i want to eat this RIGHT NOW! I agree, sometimes the best meals are the ones that someone else makes…lol. 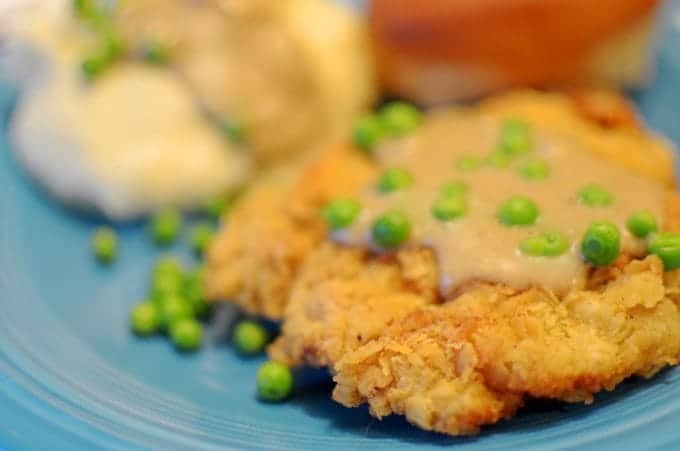 BTW- Just watched the video and now I want chicken fried steak 🙂 Drooling. Can’t wait for you to try this! Thanks, Beeta! Wish you could have joined us! !